sisu: The only thing we have to fear . . . In all such cases of international criminal psychology, we have no choice but to move beyond police work and questions of political motive, and reach for the tools of the forensic psychologist -- most importantly, the art of profiling. But it is not only or even primarily the killers and their tutors that must be so examined: Thorough profiling demands that we also study the victims, who in cases of terrorism are whole societies. The point is not to see those societies as they actually are, but as the planners of the outrage saw them. When the situation is viewed through this lens of victim profiling (never to be confused with "blaming the victim"), we can begin to see why al Qaeda's leaders and affiliates evidently began to think themselves capable of breaking an alliance that once withstood the assaults of Nazi Germany and Imperial Japan. For a widespread psychological phenomenon has gained strength in Britain in recent years, coming to a crescendo in the last few months [as blogged here the other day] . . . many Britons have subscribed to a new narrative of the post-9/11 world, one in which the U.K. is portrayed, not as a willing partner in the invasion of Afghanistan, nor as the author of much of the incorrect and/or deceptive intelligence that so rallied support in the West for invading Iraq, but rather as the largely innocent tool of a nefarious U.S.
Nations that experience collective psychological crises frequently attempt such reinventions, just as do individuals. By revising the facts surrounding irrationally violent incidents so that they themselves are somehow made responsible for them, victims often seek to exert some kind of control over if, when and how their tormentors will inflict their random cruelty. But what British citizens who have participated in this revision of the historical record do not realize -- just as Americans in 2001, Turks in 2003, and Spaniards in 2004 did not -- is that showing fear and self-disparagement in the face of al Qaeda's threats only marks the society in question as a suitable candidate for attack. Sociopaths revel most in assaulting terrified, submissive victims; and a Britain so concerned with avoiding attack that its ordinarily wise citizenry would give voice to the kind of simplistic thinking expressed in the media in recent months evidently fits that description to an extent irresistible to al Qaeda's minions within its borders. In this light, the trigger for the London bombings was far less the presence of British troops in Iraq, and far more the media circus that surrounded protestors outside the G-8 summit, as well as the utterances of musical and other celebrities during the "Live 8" performances. As a branch of sociopaths, terrorist leaders possess their own deformed cravings for fame, which makes them particularly susceptible to the false realities projected by celebrities. And if al Qaeda or one of its cohorts indeed mistook the angry but deeply confused language recently bandied about Britain as final proof that that nation's will to fight terrorism had become mortally compromised, then we may well have our answer for why the London attack occurred when it did: The long-sought-after moment when a seemingly retreating Britain could be fully separated from the U.S. had finally arrived. It only required violent exploitation. 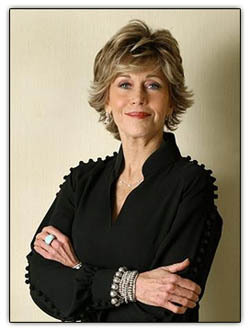 Ah,Hanoi Jane just can't help herself.She never misses any opportunity to be the Queen of Undermining The Morale of our soldiers. She is a still, at the age of 60 plus..a deeply unhappy child, having never grown into a mature adult. What a lonely and troubled life she leads.